This picture shows the 'cat chair', where Whiffet spends a lot of her time...of course she was no-where in sight when I wanted to take the picture! Imagine a rather rotund multi-coloured cat sleeping on the green towel. 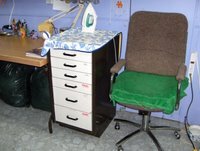 The cabinet to the left of the chair has an ironing pad on top, which is really handy when I only want to press a little item. 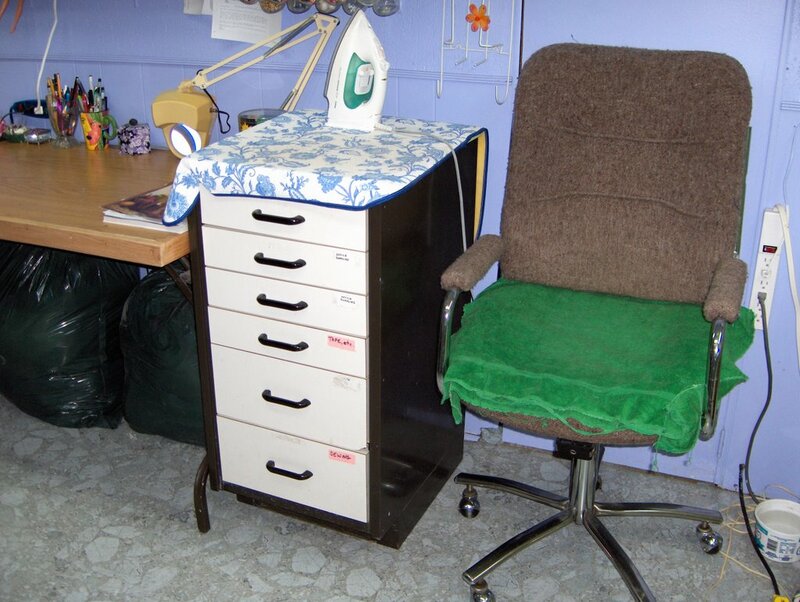 The drawers hold my office supplies and some miscellaneous sewing supplies. The table to the extreme left is my work table (actually an old door mounted on legs). The large green garbage bags beneath it are holding my supplies of fake furs for bear making (or whatever). I really need to invest in some proper containers! I won't mention that I have nine very large Rubbermaid containers in the adjacent furnace room, which are also full of crafting supplies - along with two filing cabinets full of stuff too! Hmmm....methinks I just have too much STUFF! My friend and I have declared a six month abstinence from buying any sort of crafting supplies or books and to concentrate on simply using up whatever we already have in our stash. Good, don't you think? It's a way to save money and reduce the inventory. Between the two of us I'm pretty sure we could open a store with all the 'stuff' we have. I'll let you know how it went at the end of the six months. Tomorrow we have to move our youngest son and his girlfriend, so there might not be a post. Depends on how much time I have. Summer is here! It's hot and I like it. The picture for today shows another part of our back garden (taken a few days ago). The 'ball' to the right of the picture usually has morning glories growing around it, but of course it's too early for them to show. The ball itself was an old globe from a 70's hanging lamp (we're too cheap to buy a proper gazing ball...especially when I think the lamp cost us something like three bucks!). To the right in the picture you can see a flattish table affair which holds our resident garden fairy who is laying on her tummy reading a book (what else in this house?). The table is actually on the top of the stump of our maple tree which blew down in a storm several years ago. The white 'building' is a corner of our garage. I don't know if you can tell from this picture, but there's a large overhang along the side of the garage which makes a nice sitting area. The bird feeder is next to the bed where 'Henry' resides. Behind that is 'the orchard' where we have three apple trees and a plum tree. The three big spruce trees at the back are on our property line too. 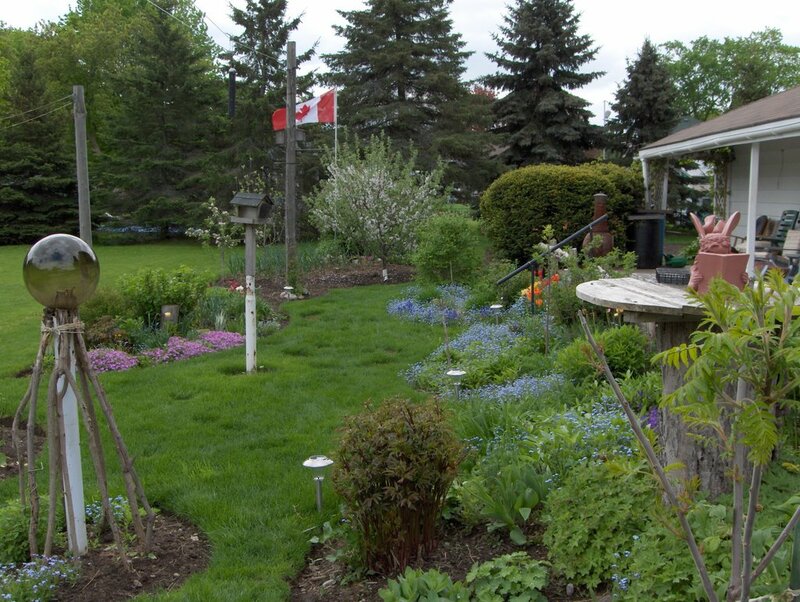 Well, it sounds like we're going to be on the garden tour this year. They're coming to look at it next Thursday so they can do the write-up for the tickets. We've been a hive of industry around here the past couple of days and think we pretty much have everything planted and ready for nature to do her thing. This picture shows a part of the back garden as it was a few days ago. 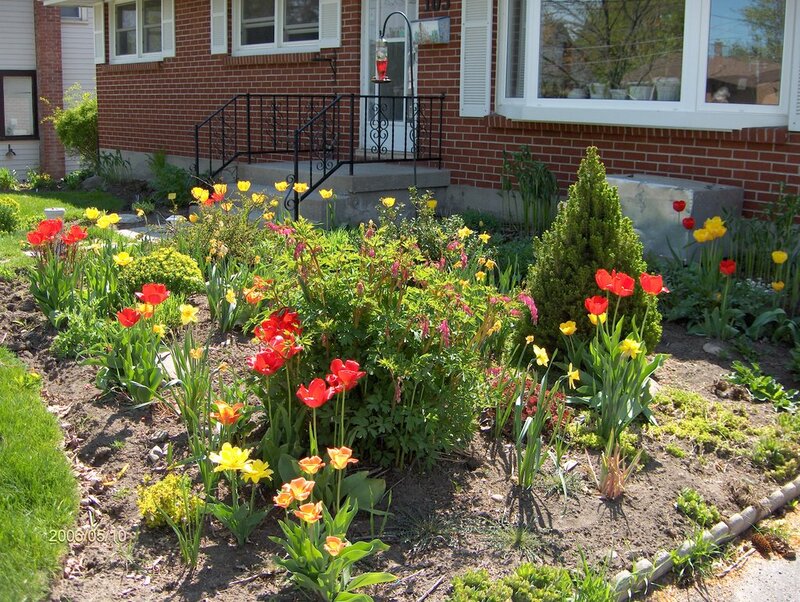 It has changed immensely since then because the perennials are ever-changing. The huge footprint-like patches in the grass are just areas Jack has re-seeded. You can see Henry too...our resident statue who looks benevolently over the garden. He's made of cement and weighs a ton! As the summer progresses I will take more pictures and keep you up-to-date on how things look. 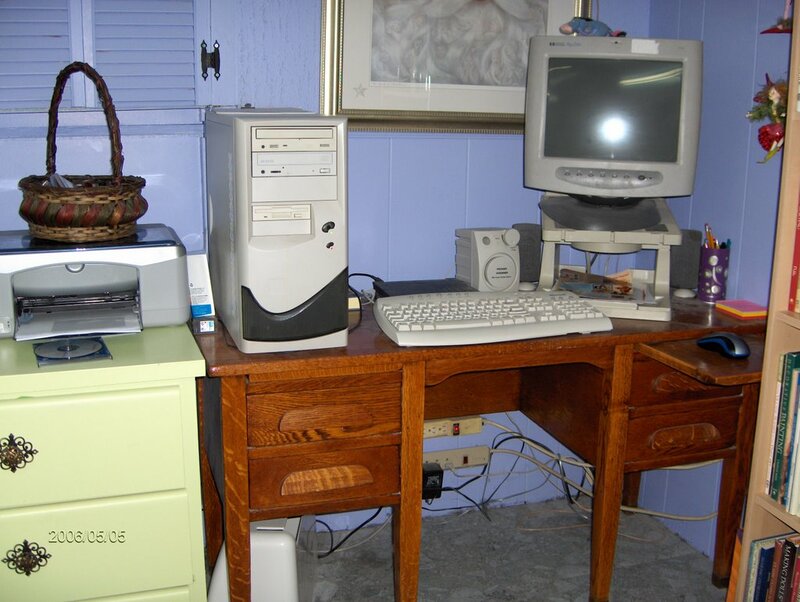 The topic today for Studio Friday was 'aged/antique' and this is my entry...a picture of my most treasured antique (which just happens to reside in my studio). Not exciting you say? Just an old ratty looking book? 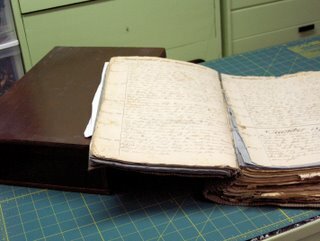 Well, this book is the diary of my great,great,great grandfather which he began writing in 1869 and ended over 40 years later, shortly before he died. There is an entry for every single day, generally beginning with the weather. He was a farmer and weather was important in his life. There are also world news entries which are inserted sideways in the margins..maybe because he only got a paper once in awhile and went back and noted things he thought were important? My dad made the wooden box to house the book and to hopefully preserve it somewhat. The pages are becoming quite brittle. 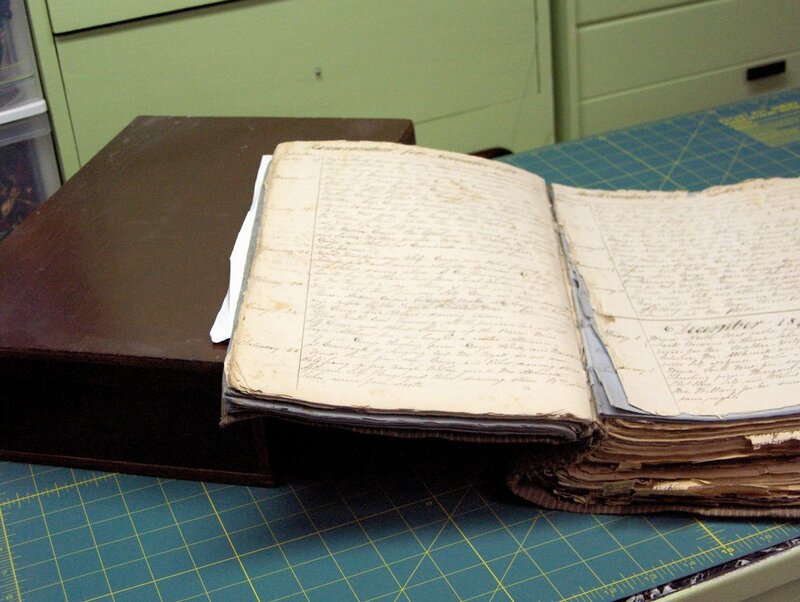 He also re-wrote the book in its entirety, which is the copy we use. Someday I hope to be able to have it published. Studio Friday is something I have stumbled across in my surfing on the net. Each Friday a topic is chosen and the challenge is to find something in your studio space or create something in your studio to reflect the topic. If you're interested go to: http://tinesparkles.squarespace.com/new-topic/ to find out more. I have to figure out how to post my entry to the site, but thought I'd start with this topic anyway. I almost hate to post this picture after the one I had to show you yesterday! 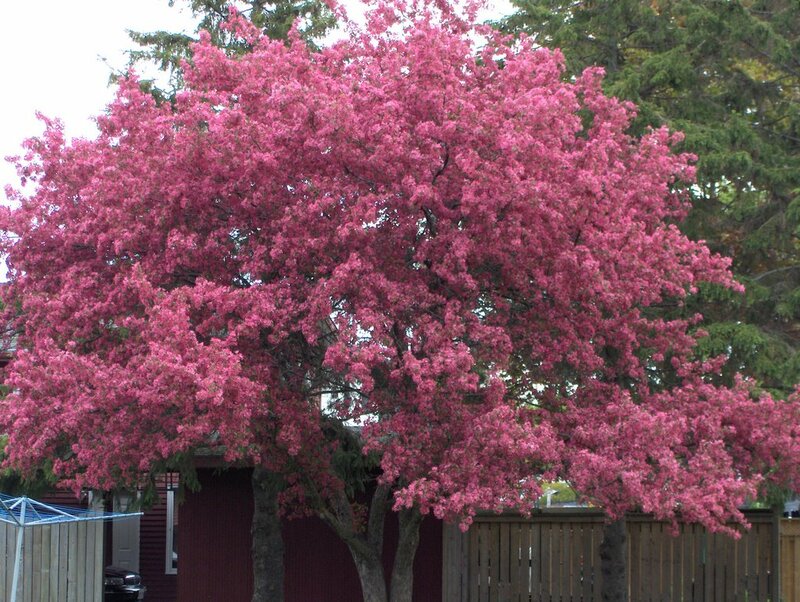 We have an area in our backyard called 'the orchard' - somewhat of a misnomer since our 'orchard' only has four trees! 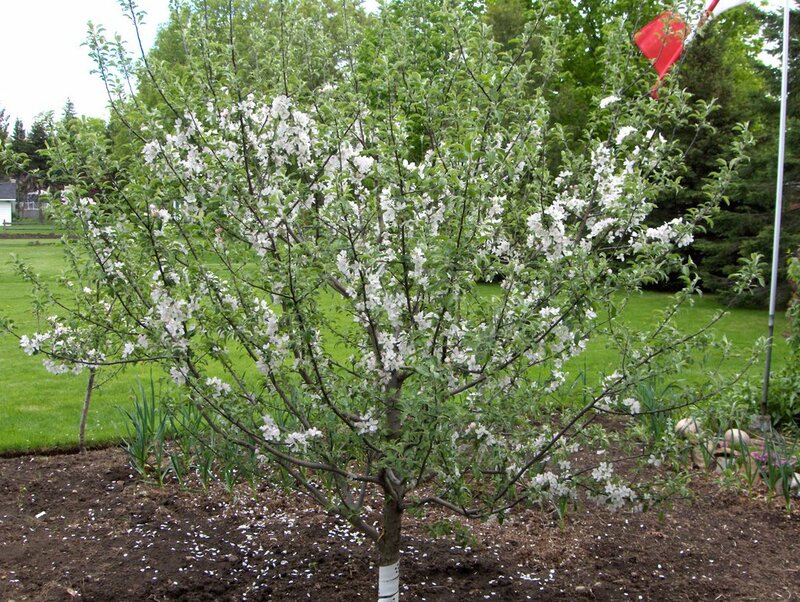 However this apple tree was loaded with blossoms and we are ever hopeful we will have some to eat come fall. Last year we only had four..three of which the squirrels sampled first. There seems to be a lack of bees doing the pollinating (suspect they are all having a feast on that lovely crab apple from yesterday and ignoring our poor little trees. Unfair! 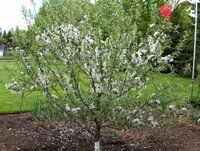 Don't the bees know that we want to eat our own apples? Sheesh. It's raining again. What else is new? 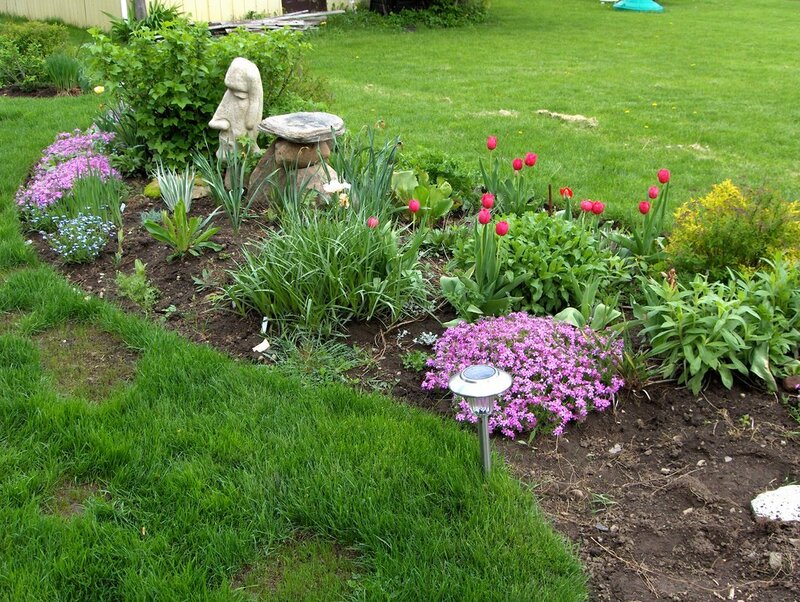 Oh well, it makes the grass grow and the plants Jack has managed to get in the ground between showers will benefit. We'll wish we had some of this rain in a few weeks when there is none to be had. Feast or famine. I'm hoping to get the planters done this weekend so keep your fingers crossed for decent weather! You know the old adage "the grass is always greener on the other side of the fence"? 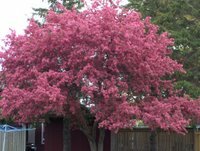 That comes to mind when we look over to our neighbours yard and see this tree! Isn't it beautiful? 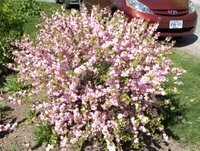 We don't have a flowering crab in our yard, but this one makes us wish we did. Had fun this afternoon looking through the new house our friends have bought. It's really nice and is absolutely ready to move into the way it is. The colours are lovely throughout and are ones I could live with quite easily. 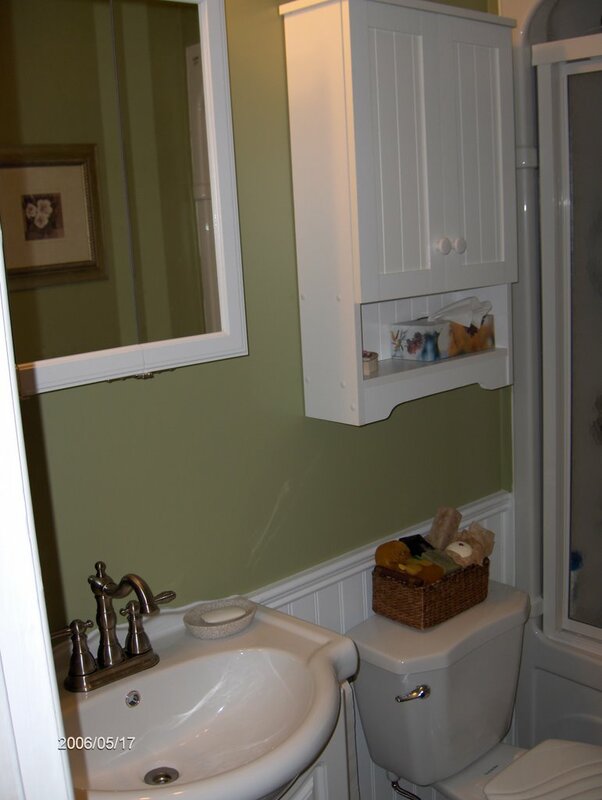 The main colour is pretty much the same as our new bathroom, so I must like it! We had our monthly CQTeers meeting at Kyms today and had fun, as we always do. After we exchanged our latest atc's we went on to trying three different methods of transfering images. Sue showed us how to transfer using turpentine, which was a completely new thing. I had read about it in Judith Baker Montano's book, but had never tried it. Kym showed us how to transfer using a product specifically created for that (the name of the product escapes me, of course). I told them how to do a transfer using a collage image and packing tape. I hadn't tried it before, but the instructions were on the ArtChix site and they turned out rather well. All in all, a fun day! 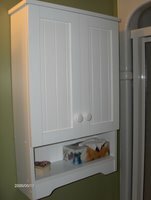 This picture is of my bead storage cabinet, open so you can see something of my storage system inside. I forgot to open the bottom doors, but trust me, better you don't see the mess inside!! Today we went shopping for more plants for Jack's garden. 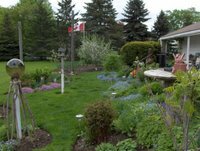 We went to our favourite greenhouse and picked up several really unusual perennials and also stopped at a few other places too. Now he's outside complaining because he has to plant them all! That's what you get when your garden is destined to be on the garden tour. Today's studio picture is my denim/bead corner. 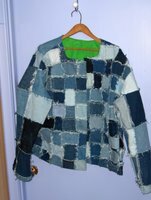 The cabinet (covered in fabric) holds my collection of recycled denim and it's FULL! Obviously I need to get busy and reduce it somewhat. There's a long coat spinning around in my brain, so that should use up a bit. My toaster oven and a radio/cd player sits on top. The toaster oven was a garage sale find with the idea in mind that I would use some of my polymer clay...not. It's sitting there, gathering dust! The only reason the non-working radio is up there is because it's far too much effort to move the denim cabinet to unplug it! Most of the time Cosmo (the black & white cat) is lounging up there too, watching me sew. 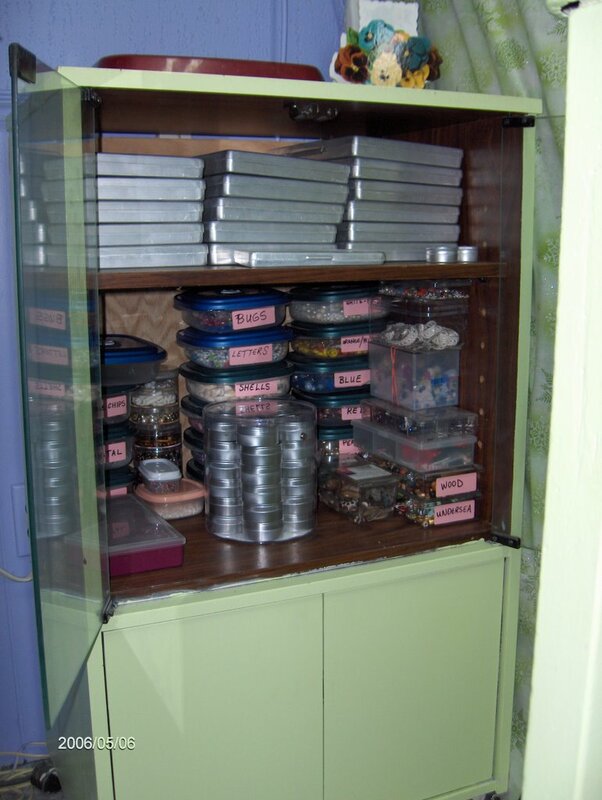 The shorter cabinet holds my beads in various and assorted types of containers. I'll take a closer picture of the inside so you can see later on. There is a bowl of cat food on top (to keep the dogs out of it). Above that is my light 'table' which is mounted on the wall for easier storage (actually it used to be for x-rays in a previous life). Hmmm... I guess if I'm going to show much more of my room, I had better clean it up so you can tell what it's supposed to look like! You really don't want to see it right now!! Ever wonder where people manage to get their driver's licences? I certainly do (cracker jack boxes, I'm sure). We had an altercation of sorts with an idiot on our way home from the city on Saturday afternoon. Despite the fact that Jack was exceeding the speed limit himself, an idiot driving a nice shiny black truck decided he needed to pass us...in a no-passing zone, and on a hill. Idiot was endangering his life as well as ours and whoever might have been coming over the hill (fortunately no-one was at that precise moment). Anyway, Jack gave him 'the finger' to which the guy slammed on his brakes, got out of his truck and started mouthing obscenities at us (still on the hill I might add). We, in turn, drove around him on the shoulder. He then passed us again and slammed on the brakes (still on the hill!!). I made a great show of writing down his plate number to which he decided to leave us be. Honestly, where do these jerks come from and why do they all have to drive trucks? No offense to the good truck drivers out there! Argh. Todays picture is of yet more storage in my room. The tall chest of drawers and the one below are full of more colours of fabrics I use for CQ (each drawer is marked with a coloured dot so I know what colours are inside). The table in front is what I use as a cutting table. The wooden box below is full of fur which I use for bears and trim on santas. The smaller drawer 'thing' on top of the left side is full of wool, fibres and trims. On the floor you can see a couple of plastic tubs...one is full of smallish pieces of denim and the other holds my UFO's (or at least some of them!). Are you tired of studio pictures yet? This one shows another storage area. 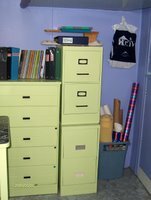 The two stacked filing cabinets hold my files of cut out/run off crafting ideas and patterns in one drawer; my Santa Claus magazines in another; my Australian Embroidery and Cross Stitch magazines in another; and (believe it or not!) there is nothing in the final drawer! Hmm...will have to rectify that, won't I. On the top I store my little ironing board and right now my album that holds my ATC collection is sitting there. To the left you can see an old chest of drawers (one of three) which holds part of my collection of crazy quilt fabrics, all sorted according to colour. Above that are some more magazines (mostly Belle Armoire, Somerset Studio, and Quilting Arts) and binders that are holding my collection of crochet, knit, tatting, and paper arts patterns & ideas (mostly those I've downloaded from the net). The blue bin to the right (on the floor) holds my rolls of 'stuff'...things like brown wrapping paper, freezer paper, wax paper, and such. The HGTV bag is holding things I have earmarked to share with my friend Kym. Are you bored yet?? I keep reading on different blogs how much people like to see where others work and how they store things, so that's the reason for the detailed 'tour'. I must admit I like getting ideas from the workplaces I've been seeing, so hope that someone can get an idea or two from me too. Went to Toronto today & picked up our oldest son and his girlfriend for the weekend. 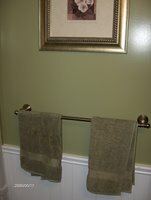 At least this time we have a bathroom they can actually use (not like it was last weekend when youngest son came home). We also stopped at a really cool kitchen store (think it's called Kitchen Stuff)...sure wish I had been rich because there was a lot in there I would have loved to have. They carry some neat little things too & we actually got a couple things for little Christmas gifts. 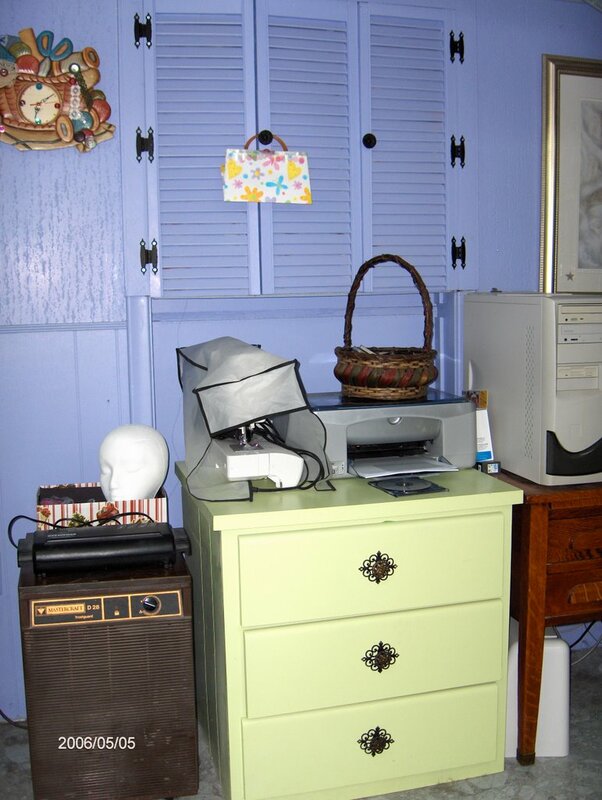 This picture shows the storage cabinet I have on one wall in my workroom. 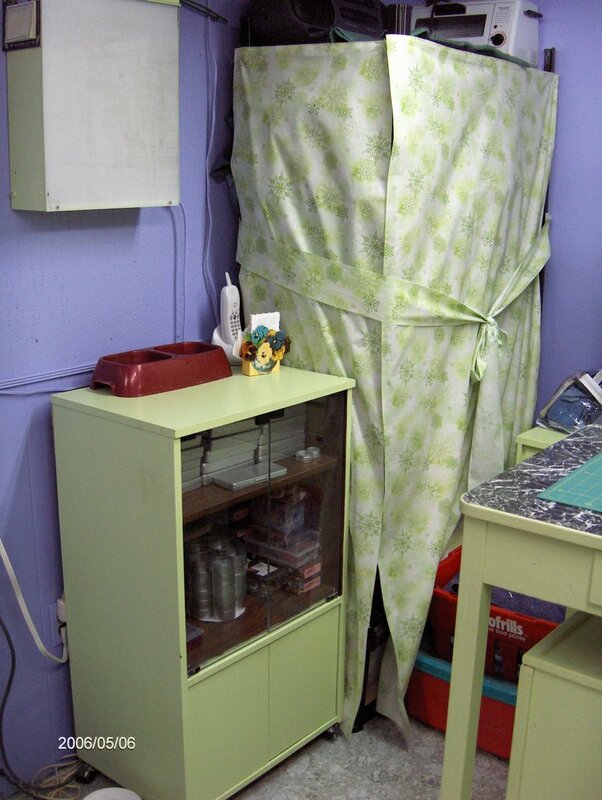 When it's not in use I have a green curtain which is velcroed to the top that I can use to cover it up. The doorway is just to the left in the picture. 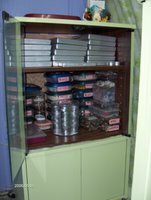 I store most of my CQ supplies in this cabinet in plastic tubs (from the dollar store!) which I have labelled with what is inside. The brown box on the second shelf up is an old jewellry box, waiting to be remade into something funky for additional storage. The bottom shelf holds a bunch of 'stuff' - mainly interfacing and bubble plastic. 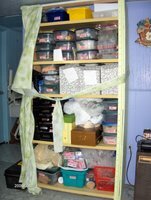 The grey boxes on the middle shelf hold my sewing patterns, my santa claus patterns and various bits and pieces used in doll-making. 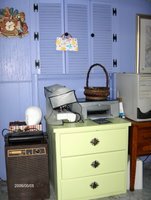 You can just see in the bottom left corner my black plastic tool box which holds all my folk art paints & brushes. I have another tool box in the furnace room which holds my leather tools. We're finally getting a day where it might not rain, 'might' being the key word! Jack is champing at the bit to get outside and do some work in the gardens, but it's been too wet. He just cut the grass (between rain showers) two days ago and it needs it again. I expect the phone will start ringing shortly with requests from his 'ladies' to get their lawns cut (he does five lawns, besides ours). There is certainly no shortage of things for him to do! 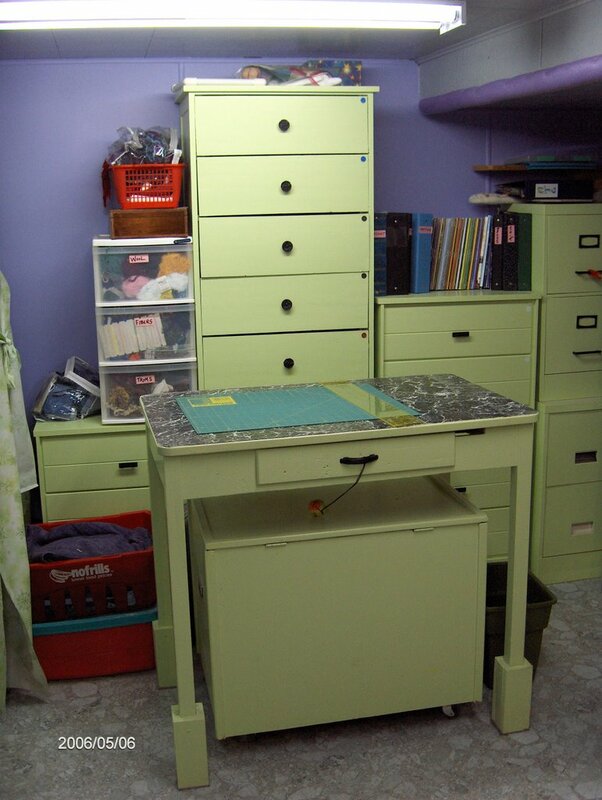 Another picture in my series of my workroom. This one is to the left of my computer. The green cabinet holds all my paper supplies for altered art and atc's, along with some funky fabrics destined to be art dolls someday. 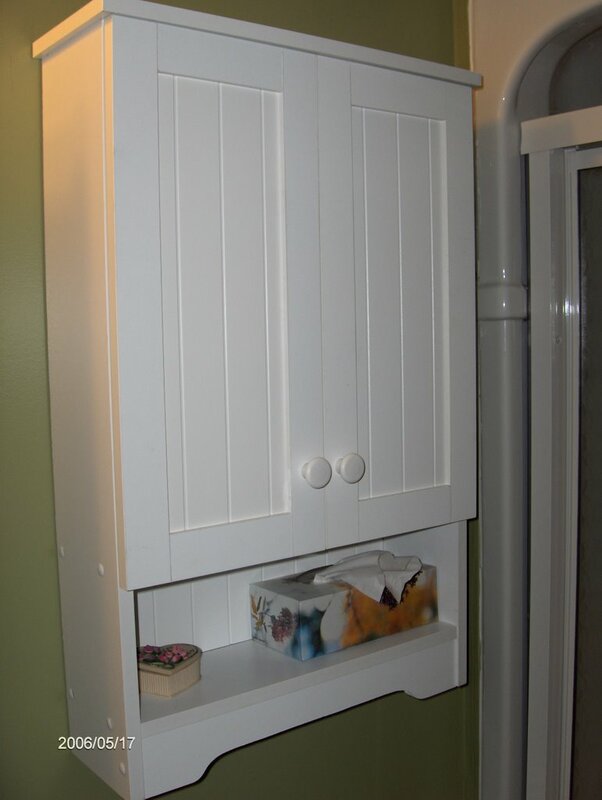 The louvered doors above hold a myriad of 'stuff' chief of which is my collection of glues, buttons and such. Of course I have the ever-present dehumidifier, which is difficult to disguise...you will note however, the 'head' residing on top. She is at some point going to be an artsy funky creation (when I get around tuit, that is!). Above that you can see the wonderful clock my friend Julie gave me for Christmas. 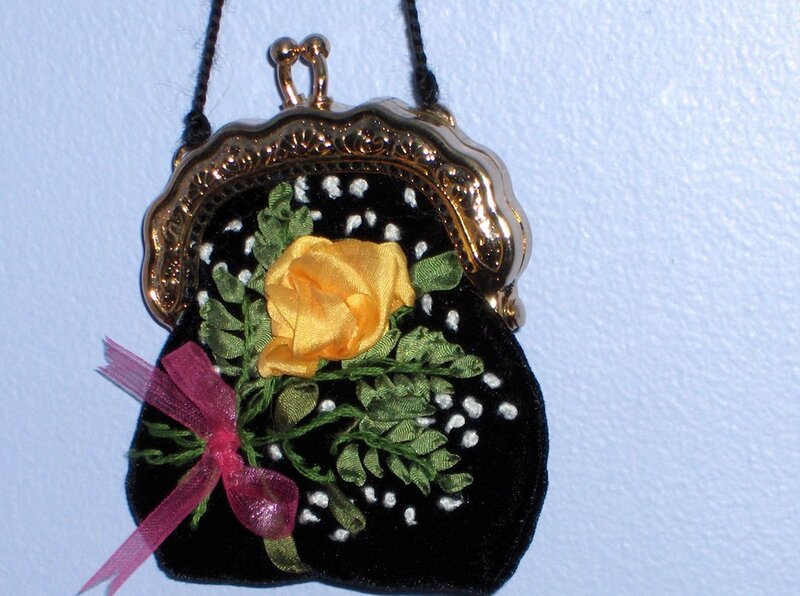 She found it at a Value Village and revamped it for me, adding buttons, needles and all sorts of embellishments. As always, if you click on the picture, you should be able to see it larger. 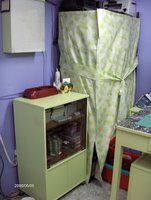 Oh yes, the covered up 'thing' on the top of the cupboard is my White sewing machine, which I keep for a secondary machine (I love my Janome!). Basket holds my current selection of favourite Cd's. Hope everybody is enjoying the 'tour' of my studio. I don't think there's anything particularly special about it, but it's mine and I love it anyway. Lots of pictures today! This is our new bathroom, which is difficult to get pictures of because its very small. However, you can get the general idea, I hope. The color is more or less a sage green with white trim, and a dark laminate wood floor. I'd still like to add a few more accents here and there when I find something I like. 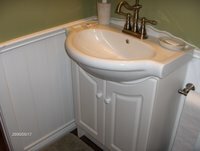 Of course everything has been rearranged and we can't find anything, but that's ok. A new bathroom is worth all the aggravation! We still don't have a toilet...well, we have one but it's just not hooked up. Maybe today? 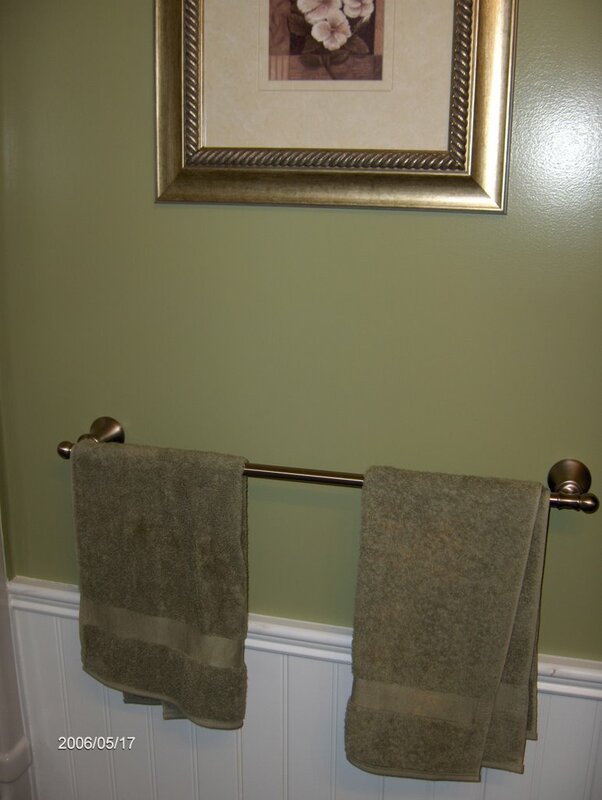 Actually the bathroom is coming along really nicely. I'm liking each new addition and can't wait to see the end result. 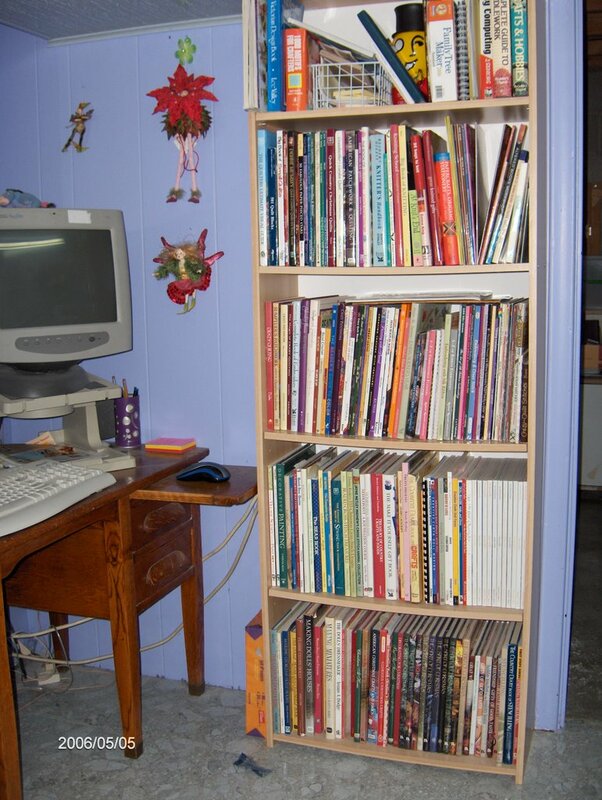 Today's picture is to the right of my computer, showing my bookshelf which is chock full of crafting books - most of which I have never used. I don't know if I prefer collecting books or making crafts!! Somehow I suspect it might be the former. The little creatures you see between the monitor & bookshelf are three guardian angels/fairies who watch over my computer (mind you, sometimes they don't do a very great job of it!). The dark strip to the right of the picture is the doorway leading into our furnace room, which is a place you definitely don't want to see. We're hoping to replace the furnace and get rid of the oil tank that's in there, which will leave more space for storage and, since it's right next to my workroom, guess who's taking it over? Mine, mine, all mine! I had a really nice Mother's Day weekend! Picked up our youngest son and his girlfriend and brought them home for the weekend. Prior to that we stopped to see our oldest son and his girlfriend and they gave me a lovely basket of soaps, which will look really nice in our bathroom until I can bring myself to use them. I love to just admire things like that for a long time (until they get dusty!) before I use them. Probably I'm weird. Then on Saturday right after lunch a large bouquet of carnations arrived at the door (from son #2). Wow...I'm spoiled! 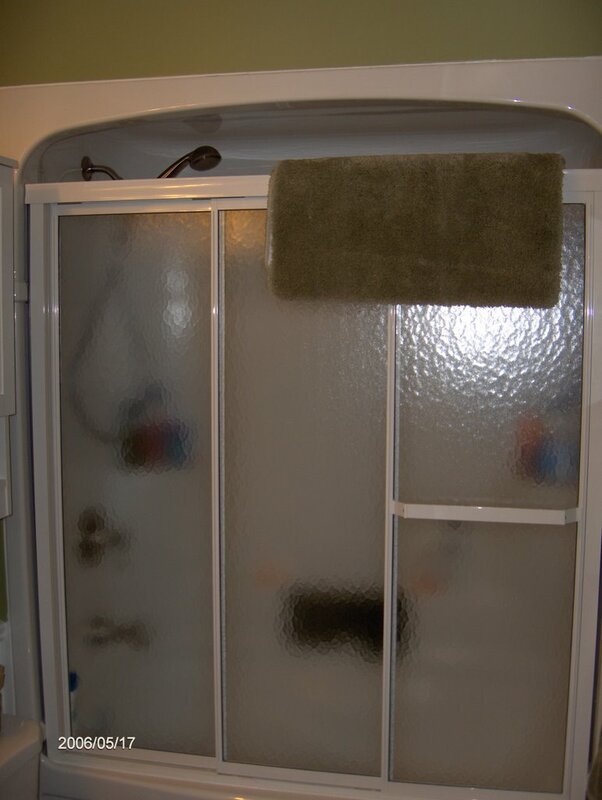 Of course we had to spend the weekend 'roughing it' as far as the bathroom is concerned. Still don't have a toilet or sink, but at least we could have a bath. Our contractor is here this morning and hopes to finish it all today. Keeping fingers crossed! I attempted to add a picture to this post, but for some reason the pictures have disappeared, at least according to Blogger. Hmmmm. Will have to see what's up with that. In the meantime, I guess there isn't a picture today. Today I am beginning to show my workroom (in all it's glory!) in a series of pictures. 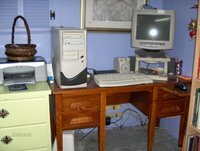 This one shows my computer corner with a little bit of my paper arts storage cabinet to the left. 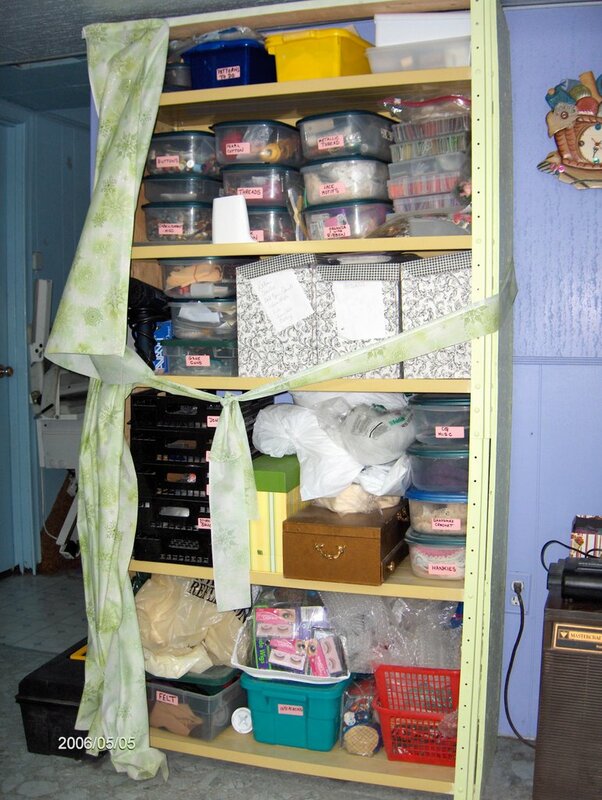 Above the paper cabinet you can just see the louvered doors which cover narrow shelves holding my glues, etc. This area is where a doorway used to go to the laundry room. 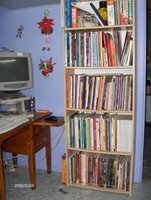 We can still use it if we have to, because Jack built my shelves to be easily removeable. The basket on top of the printer is holding CDs...right now I have IlDivo, Heart, Josh Groban and Michael Buble in there. We got to have a bath in our new tub last night! Woohoo! Of course the rest of the bathroom is nowhere near being done. 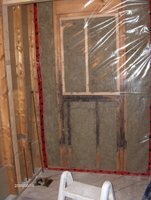 The drywall is up and in the process of being mudded & sanded. We have one son and his girlfriend coming home tonight for the weekend, so they're going to have to rough it too. Hopefully they won't mind too much. Yesterday I got the rag quilt put together ready to start snipping the seams. OH! 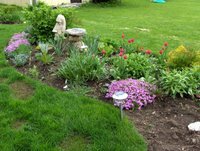 I must mention that while I was surfing around on the net I discovered a site where the person used a weedwhacker to rag the seams!! I couldn't believe it. Think it might have been John Flynn's site, but I'm not sure. Can you imagine using a weed whacker on a quilt??? 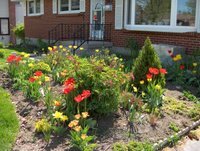 This picture is of the front flower bed, which is really pretty right now. The bleeding heart has just started to bloom. 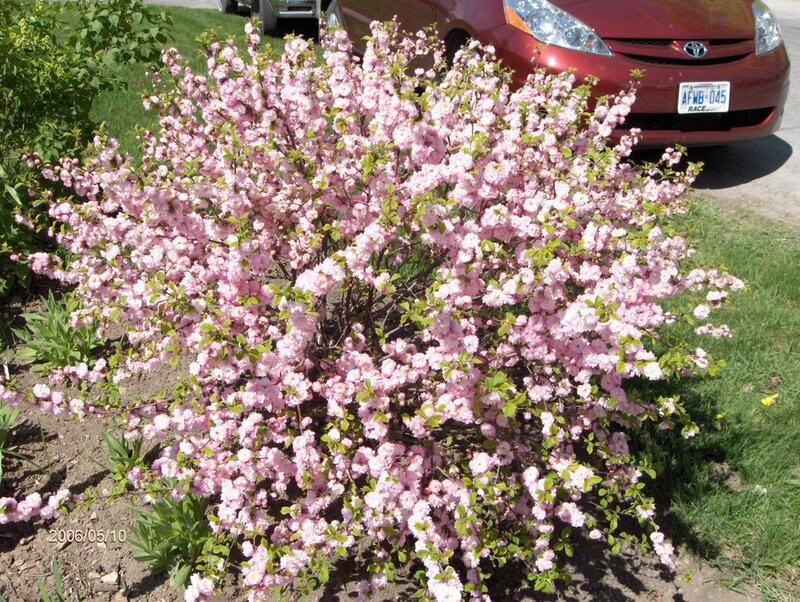 BTW...yesterdays picture was of a flowering almond (finally remembered the name). I love the new growth, the flowers and all the pretty shades of green in the spring. However I do not love my swollen eyes and not being able to breathe! Allergies seem to be really bad this year, at least for me. I look like Jack socked me one and everywhere I go I get greeted with a shocked "WHAT happened to YOU?" 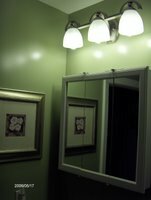 The bathroom is coming along...slowly. Hopefully the tub will be installed (and working!!) today. 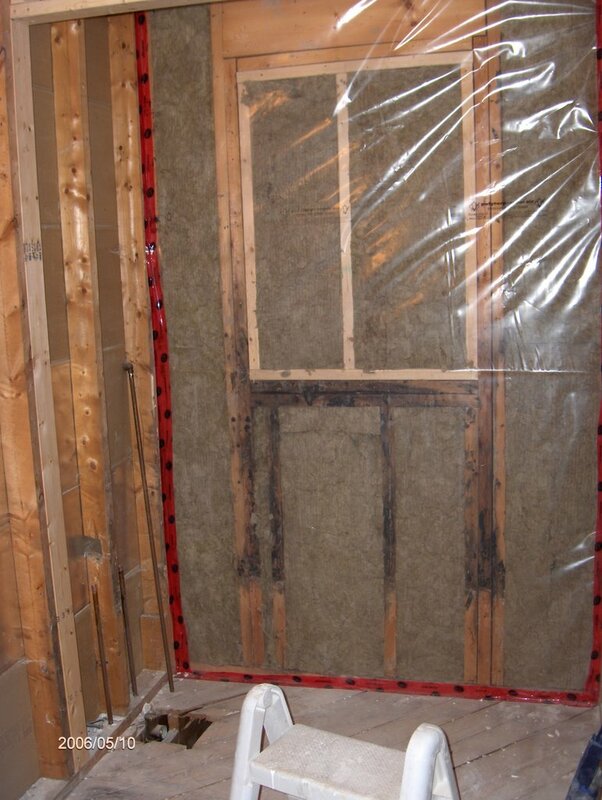 Maybe even the drywall will go up. The entire house is covered in a fine layer of plaster dust but there's no real point to cleaning it because once the drywall goes in, there will be a whole lot more. Renovating is not fun! Two pictures today...one of progress on the bathroom and the other of a gorgeous shrub at the front of our house. Don't ask the name of the shrub, because I haven't a clue! The picture doesn't do it justice though. The area shown in the bathroom is where the tub & shower surround will be going. He has filled in the useless window, which overlooks our sunroom. We could never open it because it was most embarrassing should you be in there having a tinkle and everybody in the sunroom could hear! Mind you, the sound still travelled even with it closed. 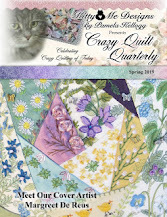 Today I'm working on the rag quilt and hoping I can get it done within the week so I can get back to my own things. Such is the plan, but that's not to say it will happen! Well we now know what lurked under our bathroom tiles and it is not a pretty picture. Yeewww doesn't even begin to describe it! Water had been leaking down under the tiles around the tub...we have 'things' growing in there. There are three layers of absolutely horrible linoleum on the floor and, because they are glued to the wooden underlay, that will have to be replaced too. The entire house is covered in a fine layer of plaster dust...great for writing messages in! Jack has removed himself to the flower beds and I'm hiding out in my workshop. At least we're getting something done! Today's picture (which I know will be what shows up first in this post and the "yeeeww" title doesn't pertain to it!) 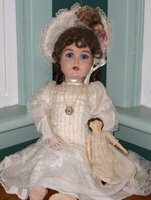 is of another of the porcelain dolls I've made. As I type the sounds of demolition are above my head. 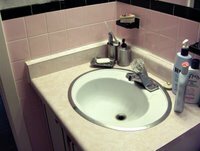 Oh the sweet sound of the beginning of the end of the pink bathroom. A week from now we will have something we can live with (we hope!). The picture today is of one of the porcelain dolls I made. I took classes in order to learn how to make her. I had to learn by doing a baby doll, which didn't interest me in the least. Then I ended up being 'hired' by the doll studio to work for them...getting paid in dolls rather than cash. It was a win-win situation because I loved working with them. This doll was the first one I got paid with. 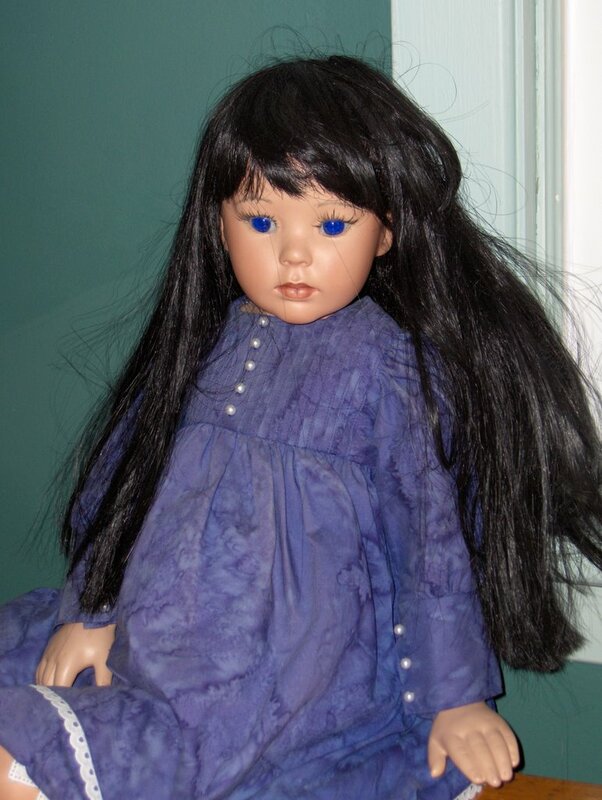 She also ended up being the doll the shop used for their advertising campaign for awhile. 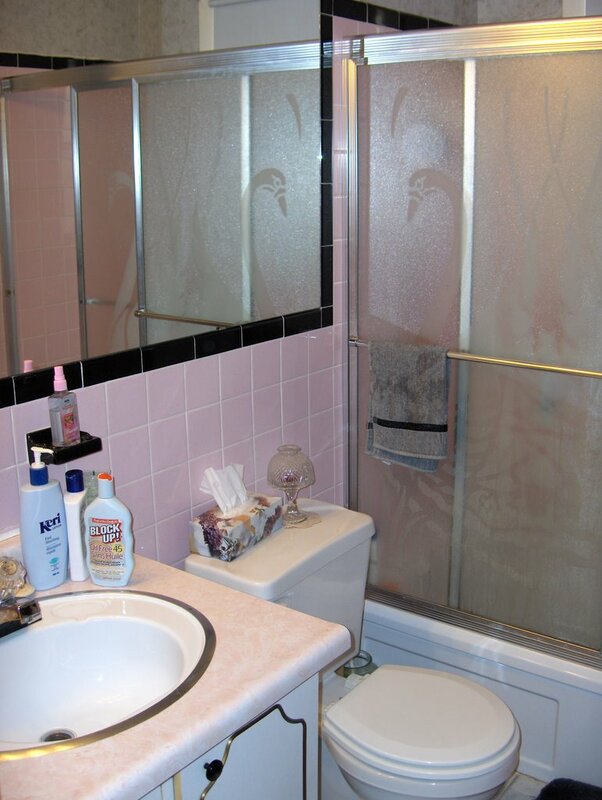 Here are the 'before' pictures of our dinky pinky bathroom. Can't stand it anymore! 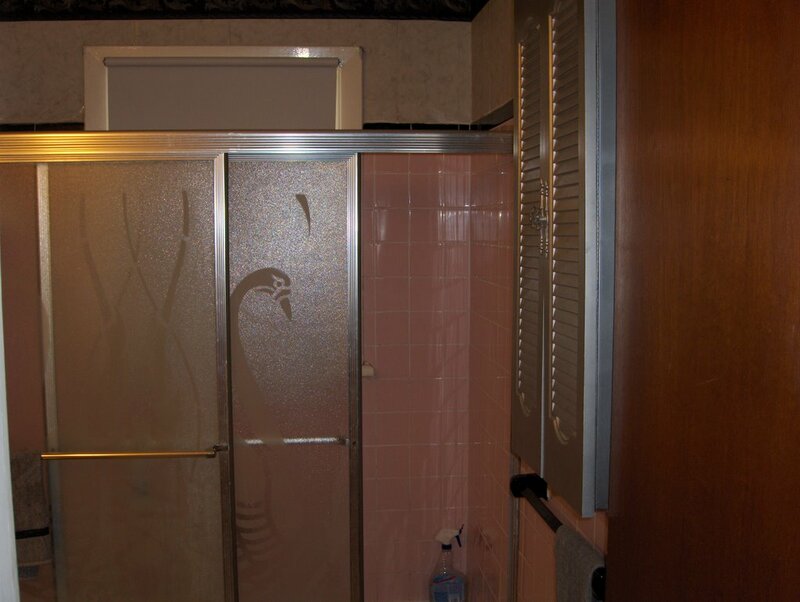 Our house was built in 1958 and this is the original bathroom, with the exception of the toilet. It's very small so it's hard to get the proper angle for pictures. 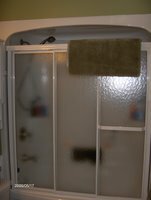 The glass shower doors are positively gross, along with the peeling paint all around the window (in back of the shower doors) and the tiles falling off the walls everywhere. 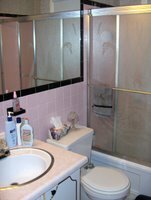 The mirror extends pretty much the whole wall (who needs to see THAT much of your bod when you get out of the shower...gross!!). 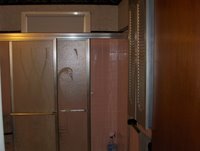 As of Monday, this is going to be gone, gone, gone and after a week of pure chaos we are assured we will have a new bathroom that is NOT pink! This is a picture of the latest jacket I made, using recycled denim, and in the rag style. It's reversible too. It's another thing out of my UFO pile. I've spent most of today revamping my bead storage area. I have a wonderful (older) friend who loves to shop at the dollar store and nothing makes her happier than picking up little 'treasures' for me. This time she had at least a dozen different bead vials, which led to me having to re-do my method of storage. It still needs work, but at least now I can maybe (key word is 'maybe'!) find what I'm looking for. 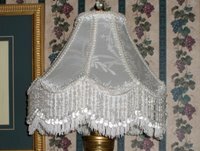 Today I have a picture of the lampshade I made at a workshop our quilt guild gave a few months ago. It was such fun to make, although I had to be careful about sinking pins into my fingers and leaving the resulting mess on it! 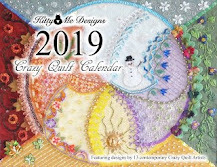 You use LOTS of pins making one of these, so there is lots of opportunity to cause yourself pain. They are pretty easy to make though - once you get the hang of it. Despite my best intentions yesterday I didn't get too much cleaned up in my workroom. Ended up getting groceries instead - boring, but necessary should we feel we have to eat for the next month. I was lucky enough to make a stop at the bookstore though and picked up a book about making fabric art journals, plus I ordered a copy of the new 'Mason Dixon Knitting' which will be delivered (soon I hope!). The mail yesterday brought my copy of the Somerset Studio book about ATC's that I have been wanting for months. It's gorgeous and will take many, many readings to even begin to absorb the beautiful artwork. New books make up for the messy workroom! Sorry it's taken so long to get back in the groove. 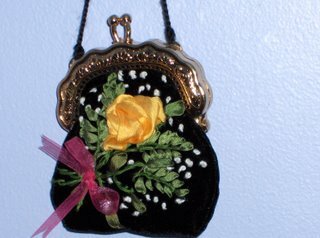 This picture is of a wee purse kit I finished a couple of weeks ago (another one of my UFO's). I seem to be amassing a collection of purses in varying sizes...not quite sure what's going on with that, but I guess this could be called my 'purse phase'. Today I plan to "attempt" to do a clear up in my workroom. Maybe I might even post pictures (of the 'after' - not the 'before' because I can guarantee that nobody wants to see it the way it is right now!! Even the dog doesn't want to be down here. I think I'm back. It's been a pretty horrendous week and now, to compound the issue, my allergies are in full hack-sneeze-and-blow mode. Hurry up trees and get done leafing out so I can breathe! Oh yeah, and as a further footnote, my tooth had an argument with a cherry pit last night and guess who lost? So, this afternoon I visit my dentist for a repair job. Can I get through it without sneezing all over him?...time will tell. Oughtta be interesting if I sneeze while he's got his fingers in my mouth (hope he's got insurance). Needless to say, nothing has been done around here, crafty or otherwise. My workshop looks like a cyclone hit it (how that happens when I'm not here, I don't understand). At this point I don't have a clue when I will get anything done at it either.